The CuZn Single Tank KDF and wide spectrum filter water filtration system is an exceptional whole house filter. It is an entirely green product, and a non-backwashing unit with some significant advantages. There is no wasted water and no use of energy when using the CuZn Single Tank KDF and their patented wide spectrum media. It is less expensive than most whole house filters and requires little or no maintenance during its lifetime. When the medias are exhausted you simply purchase a refill kit and replace the old material with the new. The addition of CuZn's patented KDF cubes allow both KDF and wide spectrum media to reside in the same tank with no channeling or packing problems. CuZn Water Filtration Systems for the Whole House provide an uninterrupted supply of pure, filtered water throughout the house and yard. All the water used for drinking, cooking, bathing, washing and landscaping benefits from being purified by one central system. CuZn Whole House Systems safeguard health and protect plumbing and appliances from staining, corrosion and scale. The Whole House Systems remove hundreds of contaminants including chlorine, DBP's, lead, heavy metals, asbestos, iron, hydrogen sulfide and hard scale. 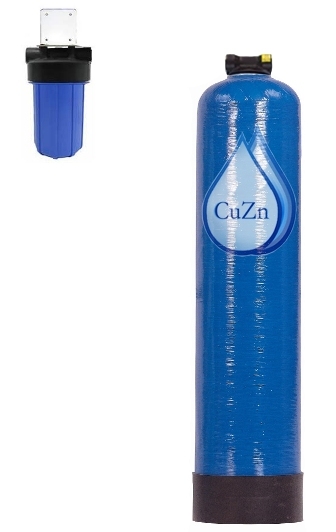 CuZn-filtered water is noticeably softer without salts or chemicals. Nor are there membranes or filters to replace. The Whole House Systems will provide years of service and most models can be refilled when the media bed is exhausted. It is a single tank system for chlorinated water with flow through head.